We welcome and appreciate the opportunity to train for Gooree Park and are pleased to announce our first winner in Bombardier (Smart Missile/High Heels) for the stud. 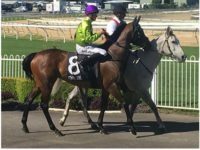 This 4-year-old Brown Gelding won a 1400m Class 2 Handicap at Hawkesbury on Thursday 3rd August 2017. He stormed up wide to share the lead before stamping his authority and winning with ease in the end. His jockey, Glyn Schofield culminated this win with a treble for the day and it was the second of a winning double for the stable. Bombardier, just like his kinfolk before him (Desert War, Laser Hawk) is a slow maturing type but shows a lot of raw talent and a huge amount of potential. With plenty of improvement to come, he has an exciting future ahead of him. We hope this will be the first of many wins to come and the beginning of a successful association with Mr Cojuangco and the team at Gooree Park.